This is only the second time I've attempted something this big. There were a lot of pieces to put together, but it went up fairly quickly. I used candy melts instead of royal icing to hold everything together and it worked just fine. I didn't cut out the bottom portion but iced it black for doors. I was afraid it wouldn't hold the weight of the upper tower. I used an impression mat, but it wasn't a very good one. Most of the design cooked out. It was suppose to look like stones. 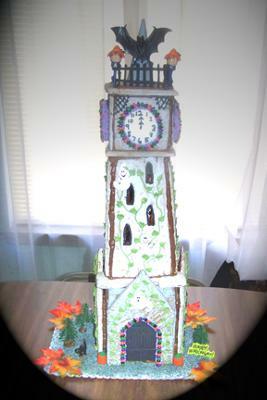 The doorway and clocks are trimmed in chocolate covered sunflower seeds. I decorated it all before putting it together. It was challenging to do, but a lot of fun. Took me about 15 hours total working off and on and it stands 2ft. 4in. tall. Thanks to Kelly for the template. 2feet is SO TALL, really great stuff. Sherri, that's just beautiful! I LOVE the Halloween touches. I really like your vines crawling up the tower and the chocolate covered sunflower seeds are really cute!